Last night, we treated ourselves to a rare spa visit. I can’t say I’m a ‘spa kinda girl’ (darn impatience), but when I got there, I vowed to make it a more regular thing. While enjoying a pedicure (which is more of a ‘necessary service’ at this point considering the six-month baby bump) I enjoyed watermelon-infused water – it was so good, I couldn’t wait to get home and make some. 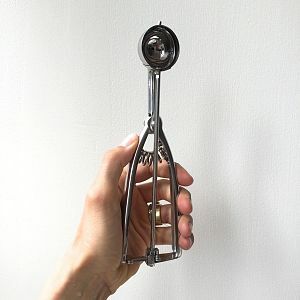 …scoop balls of watermelon flesh and place in a water jug (mine are a recent purchase from IKEA). Add a handful of fresh mint to each jug and fill with filtered water. 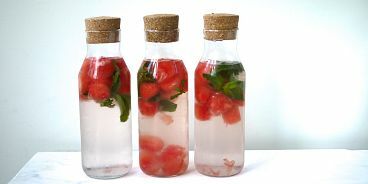 Let sit for around 12 hours in the fridge to let flavours fully infuse the water. 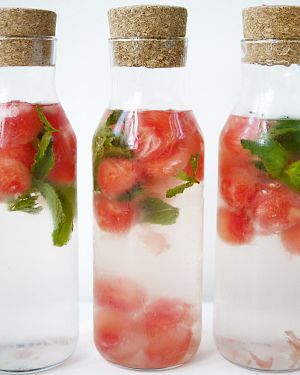 If you struggle to drink enough water on a daily basis, this definitely makes H20 consumption more fun and easy!